Join the discussion on our forums! 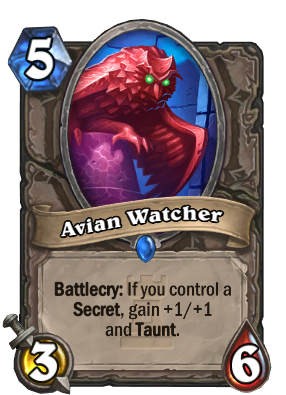 Come discuss Avian Watcher over in our dedicated Avian Watcher discussion topic. Am I mistaken or does Nesting Roc make this card obsolete? 2.04% Druid usage, 2.04% Priest...and 2.04% Paladins, who actually have secrets to activate this. Why is that? I am far from being a pro player (or even just a good one), so I am asking simply out of curiosity. Also because Paladins' secrets are the cheapest so on turn 6 you could even play the two card simultaneously and trigger it immediately. why this isn't a beast? Why is it tagged as unreleased? I can't add it to my collection. Works really well in a mage deck. I'm assuming this is a living statue and that's why it's not a beast. Slightly more control sec pally? I agree-- they should have either power creep'd Fen Creeper or made the conditional better. The risk of a 5 mana 3/6 vanilla is so bad. People are saying it's a power creep to Fen Creeper, which is not true. The taunt is conditional-- that means there will be times this is just a vanilla 3/6. To avoid this coming out as a 3/6 vanilla, you'll want to play hard to trigger secrets such as Ice Block or secrets people generally avoid triggering like Snake Trap. If it meets its condition, it's a 4/7 taunt for 5. The 7-health dies to Fireball and Hero Power, which makes it decent; but, it gets outclassed by Flamewreathed Faceless. The 4-attack helps you cleanly fend off minions like Totem Golem, Barnes, and Imp Gang Boss. Overall, I don't think this card will be competitive if Aggro Shaman remains Tier 1. Blizzard played it too safe. Playing secrets is already a tempo loss even when coupled with Kirin Tor Mage, which itself is not a tempo card when compared to Cloaked Huntress. The card should have been add +1/+2 and taunt if you have a secret in play. This would give players enough reward for lost tempo. I think the only thing this card did was successfully make Priest even worse with its 4-attack and 7-health. Gotta be honest, those card sounds are kinda creepy. Really looking forward to trying this in secret hunter. It should be a beast, it's an owl! It looks like a beast, but it's actually an arcane golem shaped like an owl.